When I started Zia’s Kitchen one of the things I really wanted to do is give my opinion on Gluten Free products. Of course my opinion is just that…my opinion. IF you don’t agree that’s perfectly all right. The thing is, gluten free baking mixes, flours, pastas, pre-packaged snacks and other products are generally more expensive then regular products. Thank you very much food industry. The quality of gluten free products differs vastly, some products are great, others can have a striking resmblance to chewing on a lightly swetened or salted piece of used cardboard. Going GF, most people know that it is incredibly difficult to find a food stuff that even comes close to the one it is meant to replace from your old gluten life. With that there is a general lowering of expectations and quiet sad acceptance that we will never again have the taste of real < insert favorite food here> and we go about our lives without dwelling upon it. Except for Pizza. As I have stated I will die trying to find pizza that tastes like non-gluten-free pizza. I will never give up! I will press on. I am a woman obsessed. Today however I wanted to share my opinion on a product I actually bought for the first time this past weekend. I was slowly cruising around Publix <kid free> thinking about the upcoming weeks menu while I shopped when I came upon one of the small areas popping up around the store dedicated to gluten free products. That said I must give credit where credit is due, when I first moved here 3 years ago the gluten free area was one tiny section of a few shelves, now the store seems to be expanding on that and gluten free brand items can be found in the actual aisle they belong to with their “non” gluten free counterparts. Keep it up Publix, although be on the lookout for my complaint about no longer selling my favorite GF brand of Pasta. Anywhoo ….I saw a shelf in the cookie isle of a cookie brand I first spied at The Fresh Market. 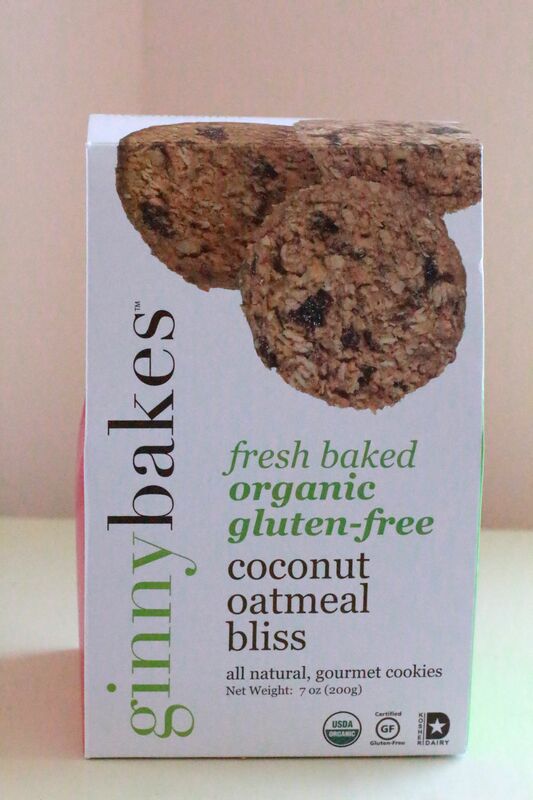 GinnyBakes Fresh Baked and Organic Cookies. I had yet to buy this brand because as I have to budget our food purchases …..<interjection: anyone who knows me personally is right now saying “Her? Budgeting her spending? and now looking out the window to see if pigs are flying by> ….but it’s true so pre-packed treats like cookies and such generally don’t make it in the cart. We also try not to “over sugar” the kids but we aren’t ogres. Mama Sis and I aren’t the kind of people that will make sure the kids to never see a pre-packaged treat until their first sleep over the way way WE were raised. Nonna was into health food in the 70’s, you know when it was generally granola, bird seed and carob. Great Nonna used to smuggle cinnamon swirl bread and other treats to us in the trunk of her car that we hid in the basement like contraband. You think I’m kidding don’t you? Nope. After getting home…….oh who am I kidding? After making it to the parking lot, I opened them up to try them. I ate 3 before I finished loading the groceries in the back of the car! In my defense I hadn’t had lunch, but still. So they were really pretty great. I was floored. Gluten free cookies generally taste far to sweet. I am guessing they over compensate and add to much sugar to make up for the lack of gluten, which makes no sense to me, but perhaps a GF baker can explain that. It was an oatmeal raisin cookie but, even better, it had a hint of coconut to it. Not to much to overpower and turn a non-coconut fan off, but enough for me to really like. I had issue with the “Fresh Baked” part and was going to investigate but then got busy and forgot. A few days later Mama Sis pulled them out for afternoon snack and I came to the living room and discovered Littledude watching Curious George with a sippy cup of milk and slowly nibbling on one of these yummies, certainly looking as if he was enjoying every bite. I am guessing they were a hit when he asked for another! Ladybug is too young for them as raisins have a high risk of the choking factor, poor Ladybug, more for us. The real test was Mama Sis though, she is even a harsher critic on GF products then I am because she has the luxury of it not being her only choice. She loved them. So much so that I contemplated hiding the rest in my room. so I decided to check out how they could claim to be fresh baked and discovered something pretty great. They are made and distributed here in Miami! Nice. Score one for South Florida today. Then I was curious as to their shelf life. Gluten free goods are notorious for needing to live in the refrigerator or freezer. I checked out the back and yup there it was “refrigerate after opening” . Oooops! Ok, that was my bad, but to be honest neither sleeve of cookies lasted more then 24 hours after opening it, so I am guessing we are in the clear and they tasted great regardless. That said I can not testify to their taste coming out of the refrigerator OR how they hold up to freezing, but straight out of the box. YUM! So my personal opinion is these are really good cookies to satisfy a cookie craving. Nice texture, good crunch factor, great tasting. All in all they were a hit in my household. 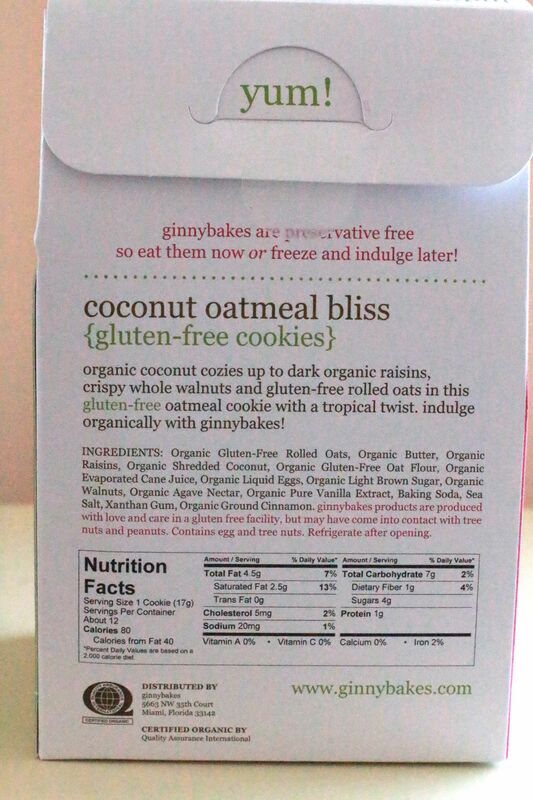 If they weren’t so pricey for 12 cookies, which I do understand as this is a boutique company using high priced organic and gluten free ingredients, I would try some of the other flavors right away, but alas we will have to wait a while before buying another flavor. When I grabbed the box to photograph it there was one cookie left and I could have taken a picture to show you.